The world of personal fabrication is continuing to grow and develop in exciting ways. DIY projects combining elements of future Fab-lab systems are gaining wider exposure among the rep rap community. In this article we will look into the Metrix Create: Space “big robot” project. The concept of a recycling system for plastic has been a long goal of the community, expressed through a host of DIY projects and forum activity. Metrix has approached this in a new super cool project. The premise behind the Create: Space project is the conversion of an existing CNC router table into a FDM 3D Printer. This machine is integrated into an industrial shredder used to convert high-density polyethylene (HDPE). The shredded chips are then fed into a hopper. There a drill and auger bit pushes the chips into a custom 6mm nozzle. This is interesting considering the majority of reprap users print with .5mm nozzles. The machine nucleus uses a DynaCNC1000 controlled using Mach3 software. The shredder, named Tarnator by its manufacturer, is a West German model that shreds into 4mm (3.8mm according to the nameplate), and the run through a second time to produce the chips. To drive the plastic into and through the head, the metrix team used an augur from Home Depot that was fed into a Harbor Freight 1 hp drill bolted to the frame. 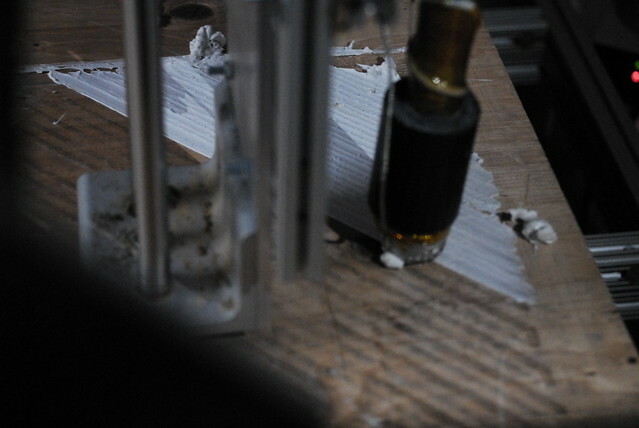 The nozzle extrudes at a thickness between 8-10mm across the printing platform at about 1 centimeter/second. This does look pormiisng. I’ll keep coming back for more. Thank you! We are working on delivering more content this week, and following up from dc tech week/dc entrepreneurs week with some cool highlights. Thank you! We are updating the website with new posts and content all this week!